Hurry! Before Meyer lemons are out of season, go make this pie! Or don’t. Just wait for the right occasion and be inspired by what citrus is in abundance at that time. The original inspiration for this recipe came from Martha Stewart as a chamomile version of lemon meringue pie in a homey cornmeal crust. All of these elements, the mellow chamomile flowers, the zesty lemon, the pillowy marshmallow meringue, and the crunchy cornmeal work together in a wonderful, satisfying combination. But with the variety of organic loose-leaf teas available from Arbor Teas, why stop there? You could alter the recipe into a summery mojito rendition by subbing in lime for lemon and organic moroccan mint green tea for chamomile, all atop a buttery shortbread crust. Organic jasmine green tea and grapefruit (or those giant pumelos) would make a sophisticated, perfumed dessert. Orange and organic earl grey black tea, or even blood orange and organic holiday spice black tea are a few more pairings I brainstormed to go with your favorite graham cracker, gingersnap, or chocolate cookie crust. Here is the original lemon-chamomile recipe. Let me know what combinations you dream up! Pulse flour, cornmeal, salt, and sugar in a food processor to combine. Add butter, and process briefly until mixture resembles coarse meal. With the machine running, slowly add ice water until dough just begins to hold together. Shape dough into a disk, wrap in plastic, and refrigerate until firm, at least 1 hour. Roll cornmeal dough to 1/8-inch thickness on a lightly floured surface. Ease the dough into a 9-inch pie dish and trim the edges, leaving a 1-inch overhang. Tuck overhang under dough so edges are flush with rim and crimp edges. Prick the bottom of dough with a fork in several spots and chill for 30 minutes. Line dough with parchment and fill with pie weights or dried beans. Bake until edges begin to turn golden, about 15 to 18 minutes. Lift up the parchment to remove the pie weights. Continue to bake, uncovered until the crust is golden brown, 12 to 15 minutes more. Let cool completely before adding the cream filling. When ready to make the filling, bring milk to a boil in a medium saucepan. Remove from heat, add the loose leaf tea directly to the hot milk, cover, and steep for 5 minutes. Strain the milk through a fine sieve into a bowl, pressing on the spent tea leaves with a spatula to extract as much liquid as possible. Discard tea. Combine cornstarch, sugar, and ¼ teaspoon salt in a medium saucepan. Whisk in the tea-infused milk. Turn heat to medium-high and cook, stirring constantly, until bubbling and thickly coats the spatula. This should take about 7 minutes total (about 2 minutes after it comes to a boil). Whisk yolks in a separate bowl, then pour in the milk mixture into the yolks in a slow, steady stream, whisking until thoroughly incorporated. Return the mixture to the saucepan. Cook over medium heat, stirring constantly, until it returns to a boil, 1 to 2 minutes more. Remove from the custard from heat, and stir in lemon zest and juice. Add butter, 1 tablespoon at a time, stirring until butter melts before adding the next piece. Let cool in the saucepan off heat, whisking occasionally, for about 10 minutes. Pour custard into the prepared crust. Press plastic wrap directly on surface of custard, taking care to smooth out any wrinkles as these will appear on the finished pie as it firms. Refrigerate at least 4 hours (or overnight) so that the custard filling is chilled and firm. Just before serving, combine egg whites and sugar in a heat-proof mixing bowl set over a saucepan of simmering water. Whisk until the sugar dissolves and the mixture is warm, about 3 minutes. Remove from heat and add vanilla, cream of tartar, and a pinch of salt. Transfer the bowl to the mixing stand and whisk on medium-high speed until shiny, stiff peaks form, about 7 minutes. Pipe the meringue in dollops over the pie. If you’d like, toast the tips of the meringue with a culinary torch. 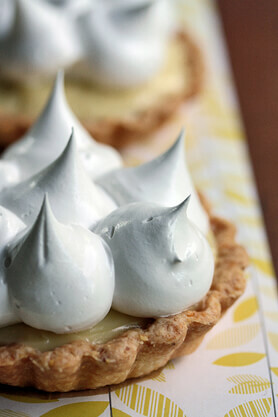 Or, bake the meringue-topped pie briefly on a rimmed baking sheet under a broiler until lightly golden.